While I may not totally agree with all of its arguments, and some of it is clearly Australia-specific, this set of replies by the blog Blackfellas to the “Top Ten Colonist Self Justifications” offered by white Australians is hilarious. I have no doubt Aboriginal peoples in Canada and the US can easily adapt these rationalizations to this part of the world. The list nails the usual litany of excuses trotted out by some non-Aboriginal people when confronted with the possibility that they may in some small way benefit from the fruits of colonialism past and present. I’ve only presented the self-justifications. Visit Blackfellas to see their amusing replies. You have to move forward. Aboriginals must share responsibility for where they are today. We all have equal rights. Government spends a billion dollars a year on Aboriginals. We gave you the right to vote. We must all move forward together. † Aboriginal and Torres Strait Islander Commission, a now-defunct national Aboriginal organization: ATSIC was disbanded in 2005 after being mired in controversy, replaced by the National Congress of Australia’s First Peoples. I invite readers to supply their own replies (or excuses) in the comments section below for the Canadian context. 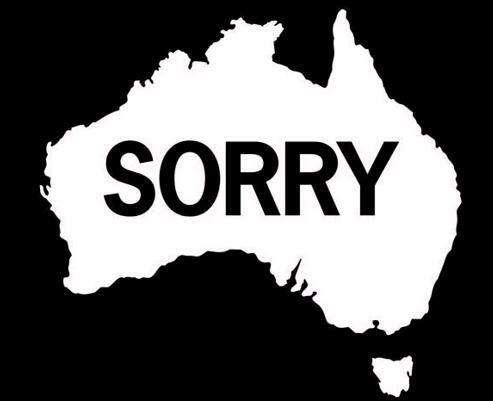 Let me start it off: “Uh, didn’t our Prime Minister say ‘We’re sorry’?” Hey, that works for Australia too! Dear MI the post above might cause a lot of congratulatory slapping on each others back but for those less fortunate in terms of education, salary,housing or elderly people who lost loved ones in the common wealth struggle in Europe your words are likely to be internalised and add to a sense of hoplesness .How or when should folk get a perspective on history and now, or should they never ? What should that perspective be ? Indians had no concept of land ownership. It’s not really stealing if the other party doesn’t even know that they own something. Settlers came in and could have killed everyone making them slaves but instead they let them live and gave them money and land.